This Corn Relish is perfect for so many occasions; add a spoonful to a Ploughman's Platter, make it a staple ingredient on a ham and cheese toastie, serve it with fresh sandwiches or mix through a tub of light cream cheese to make a tasty dip! In a large heavy based saucepan or stockpot, heat the olive oil and gently saute the red and green capsicum with the onion. Add Vinegar, caster and brown sugar, turmeric, mustard, pepper and salt. Reduce heat to low and stir until the sugars are well dissolved. Increase the heat to high and boil for 10 minutes. Add the corn and boil for a further 5-10 minutes (corn should be well cooked). Add the cornflour and water mixture gradually and stir well. Bring to the boil, stirring well to ensure no sticking. Simmer until the liquid reduces enough to bring your relish to desired consistency (remember it will thicken slightly more once cooled). Divide amongst sterilised jars - leaving 1 - 1.5cm between the relish and the top of the jar. Turn upside down for 3 - 5 minutes. Then return to right way up and leave to cool. Be sure to allow relish to cool naturally - placing in the fridge or cold water could make the glass jars shatter. Notes... Once you try this Corn Relish, you'll never go back. The tangy flavour the combinations in this Corn Relish bring to the party are delicious. An all time favourite and perfect for any meal you have in mind! Corn relish is simply so good and is an all time favourite relish. Thanks for your corn relish recipe Nikki! 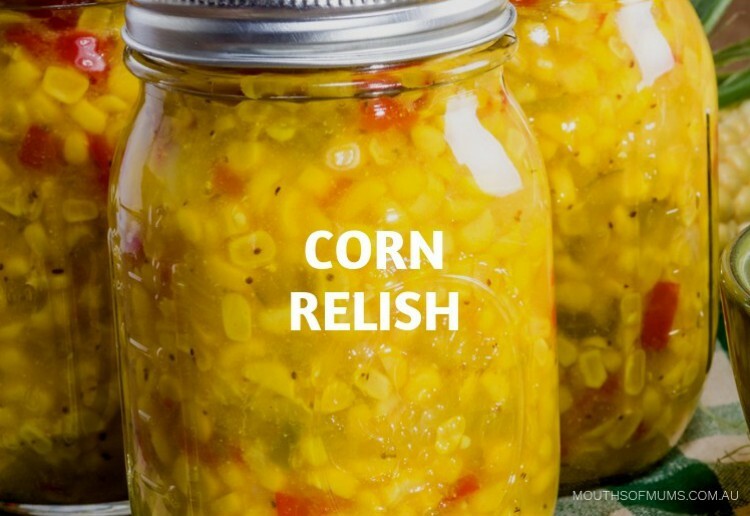 We look forward to making and trying this corn relish, amazing recipe. Thanks so much! We love corn dip too! So easy to make and it impresses everyone! Home made corn relish,such a treat! Thanks Nikki! Thank you for this, have lost my recipe and was looking for a new one.